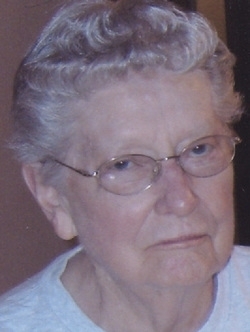 Norma Anderson age 86, of Monticello and formerly of Center Junction died Thursday, June 7, 2012 at the Monticello Nursing and Rehabilitation Center following an extended illness. Funeral services will be held at 11:00 Tuesday morning, June 12, 2012 at the Center Junction Presbyterian Church with interment in the Antioch Cemetery rural Anamosa. Friends called from 4 to 7 Monday at the Goettsch Funeral Home, Monticello. Rev. Jean Bruinsma officiated at the services. Survivors are two sons, James (Karen) Anderson, Monticello, Randy (Suzanne) Anderson, Ottumwa, five grandchildren, Mel (Jerry) Pasker, Desi (Matt) Kray, Alaina (Adam) Whitt, Scott (Angela) Anderson, Betsy (Matthew Brodersen) Anderson, five great-grandchildren. She was preceded in death by her parents, her husband, Duane, and a brother Glenn Hinrichsen. Norma J. Hinrichsen was born March 17, 1926 near Olin, Iowa. She was the daughter of Benhart and Nellie (Tenley) Hinrichsen. Norma attended the Lisbon schools and graduated from Viola High School in 1944. Norma J. Hinrichsen and Duane Anderson were married on November 20, 1945 at the United Methodist Church in Anamosa. The couple farmed in Jones County. They moved to Center Junction in 1971. Norma was the Center Junction correspondent for the Midland Times, Anamosa Journal, and Monticello Express. Norma was a member of the Center Junction Presbyterian Church. She served on the Session, was an Elder and served as President of the Presbyterian Women. She also belonged to the Center Junction Women's Club, the Jones County Historical Society, the Jones County Election Board, the Ever Ready Club, and Altrurian Women's Club in Onslow.